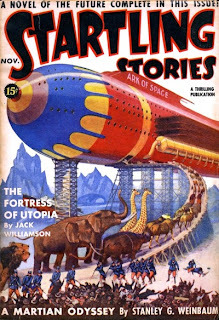 I have a new post up over at Science in My Fiction - "Room Needed on the Ark" - that considers the following scenario: if Earth were in imminent danger of destruction and we had a space ark that could carry humans, animals, and plants to safety, how would we decide which animals to rescue? and how many individuals of each species we'd need to bring along? Part of the answer depends, of course, on what the goal would be. Setting up a human colony on another planet might have different requirements than if the goal was to restore life on a ravaged Earth. To set up brand new self-sustaining ecosystems would likely require a wide range of animals and plants, whereas a self-contained and highly technological settlement might not. And I think there is a bigger picture to look at. If we want to be able to save species from going extinct, or to have a repository to maintain genetic variety in crop plants, we need to be collecting samples and genetic material now (which is being done). So if we want to keep our precious gene banks from danger, do we spread them out in multiple countries? or do we build a DNA library on the moon? So many questions! Read "Room Needed on the Ark" and share what you think.